TCe 180: Replacement every 72,000 miles or 6 years (tensioner pulley & guide pulley must be replaced). 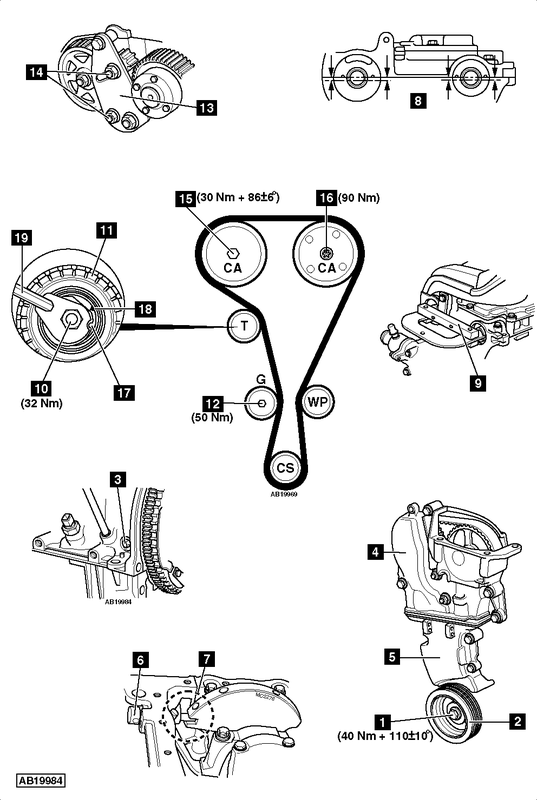 Renaultsport 250: Replacement every 75,000 miles or 6 years (tensioner pulley & guide pulley must be replaced). Camshaft setting bar – Renault No.Mot.1496. Camshaft sprockets locking tool – Renault No.Mot.1801 or Mot.1509-01. Crankshaft timing pin – Renault No.Mot.1054. Exhaust camshaft blanking plug tool – Renault No.Mot.1488. Inlet camshaft blanking plug tool – Renault No.Mot.1487. NOTE: Engines with variable valve timing: Mark camshaft sprockets and camshaft adjusters with chalk or paint prior to timing belt removal to assist alignment on installation. NOTE: DO NOT refit used belt. Replace auxiliary drive belt tensioner pulley and guide pulley. Lock flywheel with large screwdriver. Slacken crankshaft pulley bolt  . Water pump. DO NOT disconnect hoses. Turbocharger (TC) boost pressure vacuum hose. Disconnect fuel vapour hose(s) from evaporative emission (EVAP) canister. Blanking plugs from rear of camshafts. Turn crankshaft clockwise until grooves in rear of camshafts are just before horizontally aligned position. NOTE: Grooves located below cylinder head upper face. Insert crankshaft timing pin in cylinder block  . Tool No.Mot.1054. Turn crankshaft slightly clockwise. Ensure timing pin located correctly in crankshaft  . Ensure grooves in rear of camshafts horizontally aligned  . Fit setting bar to rear of camshafts  . Tool No.Mot.1496. NOTE: Tensioner pulley and guide pulley MUST be replaced. Ensure timing pin located correctly in crankshaft  . NOTE: Ensure timing pin not inserted into crankshaft web balance hole. Ensure setting bar fitted correctly  . Remove crankshaft sprocket. Degrease sprocket. Degrease end of crankshaft. Fit camshaft sprockets locking tool  . Tool No.Mot.1801 or Mot.1509-01. Tighten camshaft sprockets locking tool nuts  . Tightening torque: 80 Nm. Blanking plug from inlet camshaft sprocket. Exhaust camshaft sprocket nut  . Inlet camshaft sprocket bolt  . NOTE: Replace camshaft stud if loosened when removing nut. Degrease ends of camshafts and camshaft sprockets. Finger tighten exhaust camshaft sprocket nut  . Finger tighten inlet camshaft sprocket bolt  . Fit new tensioner pulley  . NOTE: Ensure lug on rear of tensioner pulley located in groove in cylinder head. Tighten tensioner pulley nut finger tight  . Tighten guide pulley bolt  . Tightening torque: 50 Nm. Turn tensioner pulley clockwise until marks aligned  &  . Use 6 mm Allen key  . NOTE: DO NOT turn tensioner pulley anti-clockwise. Tighten tensioner pulley nut  . Tightening torque: 32 Nm. Fit camshaft sprockets locking tool  . Tighten exhaust camshaft sprocket nut  . Tightening torque: 30 Nm. Tighten inlet camshaft sprocket bolt  . Tightening torque: 30 Nm. Camshaft sprockets locking tool  . Turn crankshaft two turns clockwise until grooves in rear of camshafts are just before horizontally aligned position. Insert crankshaft timing pin in cylinder block  . Fit setting bar to rear of camshafts  . Ensure tensioner pulley marks aligned  &  . If not: Repeat tensioning procedure. Remove exhaust camshaft sprocket nut  . Remove inlet camshaft sprocket bolt  . Fit new exhaust camshaft sprocket nut  . Fit new inlet camshaft sprocket bolt  . Tighten inlet camshaft sprocket bolt  . Tightening torque: 90 Nm. Remove camshaft setting bar  . Tighten exhaust camshaft sprocket nut  . Tightening torque: 86±6°. Fit timing belt lower cover  . Fit new crankshaft pulley and bolt  &  . Tighten crankshaft bolt  . Tightening torque: 40 Nm + 110±10°. Fit new blanking plug to inlet camshaft sprocket. Fit new blanking plug to rear of inlet camshaft. Use tool No.Mot.1487. Fit new blanking plug to rear of exhaust camshaft. Use tool No.Mot.1488.